Black singer, songwriter and Tea Party Express spokesperson, Lloyd Marcus here. We just finished our Tea Party Express IV national bus tour rally in Columbus, OH. The crowd was electric with excitement, extremely eager to vote this Tuesday. Back on the bus headed to our next rally in West Virginia, I opened this absurd email from a black liberal democrat long time friend. My friend knows I'm conservative but still includes me in his emails to his black liberal democrat friends. 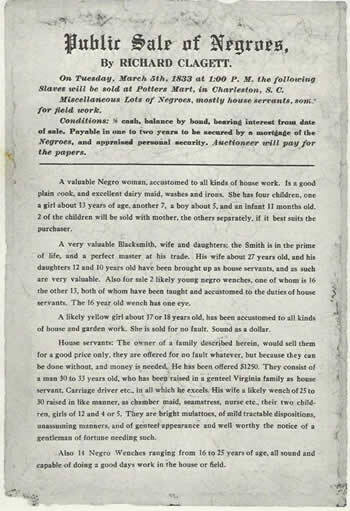 Attached to his email was a flier from 1833 promoting a slave auction/sale titled, “Public Sale of Negroes”. Here is the text of his email instructing his black friends what to do with the 1833 flier. Folks, how on earth can a reasonable thinking person tie the auction of black slaves in 1833 to Tuesday's election. Rather than dealing with the real reasons why former Obama supporters are enthusiastically voting against his regime, democrats can only resort to race baiting by ginning up fear and hate to inspire their lethargic base to vote. I am continually amazed by black Obama-ite's inability to look beyond race and deal with the issues; record unemployment, the nationalization of banks and auto industry, Obama's historic government overreaching and most outrageous, his cramming Obamacare down our throats against the will of 70% of Americans. Race obsessed Obama-ites who persist on making all opposition to Obama a matter of race are the real racists. Tea party patriots will not be stifled or intimidated by their hate, accusations and dirty tricks. Come Tuesday, Obama's anti-American socialist agenda is goin' down! For the record, the Republican Party was founded to end slavery. History reveals democrats to be the true enemies of black Americans. The KKK was founded by democrats to stop blacks from voting via intimidation. In the 50s, democrats blocked the entrances of white schools to prevent integration by blacks. And, for the past 50 years, in their attempt to keep a monolithic black vote, democrats have despicably infected blacks with a victim-hood entitlement mindset. Despite the highest office in America being held by a black man, unfortunately many blacks still view their lives from the “weak” position of believing America owes them something. Thank you democrats. Black democrats, come taste the refreshing sweet “tea” of freedom, liberation and respect offered to you by your fellow American brothers and sisters in the Tea Party Movement. You've been drinking the poison Kool Aid from the liberal democrats for far too long. God bless.